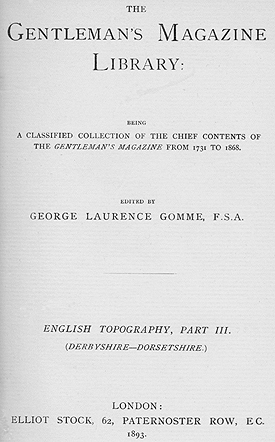 A collection of articles submitted to the Gentleman's Magazine between 1731 and 1868. There is a wealth of information for the historian and genealogist alike. The Editor's Preface, transcribed in full, is worth reading. Not every town and village is described; sometimes quite large towns are completely omitted yet tiny villages are included whilst some important subjects are scarcely mentioned as they were, clearly, not of interest to the contributor. Here are the views of individuals, honestly given and not seen through the rose-tinted spectacles of the writers of the nineteenth century tourist guides. Full transcription of Derbyshire. Part transcript of Devon. Dorset has not been transcribed. There are some delightful small decorative engravings in the book and several are included in the text. The engraving above is one example. Although the book contains no illustrations, individual articles within it refers to "Plates" which appeared in the original journals. An image of the 'Revolution House' at Whittington, that was discussed in the Gentleman's Magazine, has been found in another source so it is included here. from the section on: Ancient Church Architecture.